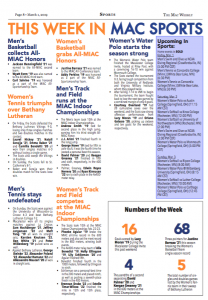 The newest member to the Macalester club sports community is Mac Co-ed Club Tennis. Although the team is still in its provisionary phase, cofounders Isaac Gamoran ’18 and Maddy McKeown ’18 are excited for the future. “It was mostly Isaac who had the initiative. At the end of last semester I was lamenting the fact that we didn’t have a Club Tennis team, and then I heard from a friend that Isaac was trying to start one,” McKeown said. After the two met and put their heads together, their first step was to talk to Vanessa Seljeskog, Associate Director of Athletics and Club Sports Director. “Vanessa was super helpful and supportive with the whole thing,” McKeown said. As the team is still in its first semester, it is not considered an official club sport at Mac despite going through part of the club sport registration process. After acquiring sufficient student signatures showing interest in the creation of the team, Seljeskog helped them get a table in the Org Fair at the start of the year and worked with them to reserve the tennis courts and field house for practices. After the end of the 2016–2017 academic year, McKeown and Gamoran will meet again with Seljeskog to complete the process. Some obstacles the co-founding captains have faced involve the time commitment required to organize and attend practices as well as the difficulty of incorporating people with all levels of tennis experience, especially without coaches or gear. Despite these challenges, the two have found the silver lining. “Some of our biggest practices have been the ones where people who have played before and people who haven’t both come and then we can split up… Occasionally, I would take people who had never played before and teach a little bit,” Gamoran said. A downside to this is that it splits up the team. “It’s hard when you have to divide people up like that to still make people feel like part of the team,” McKeown said. “It’s really not that hard when it’s tennis because I know I want to play and I know I want to see everyone that’s there. It’s like, yes I have other work to do, but this hour and a half where I’m going to play tennis is not an hour and a half that I’m going to regret,” Gamoran said. Gamoran and McKeown are eager to play more and grow as a team, despite their worries and challenges. “When we play matches and people are bonding with their partners, it’s really fun to see,” McKeown said. Going forward, the team will be under new leadership for next semester as Gamoran and McKeown will be studying abroad, but the hope is that next year the team will become an official club sport at Mac. 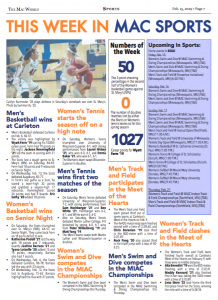 “The USTA has a program called Tennis on Campus and there are other club teams in the area [to play against]. It would be incredible to be able to play other teams. That’s like big world, big dreams,” Gamoran said. Practices are Tuesdays and Thursdays at 4:45 p.m. and 10:00 a.m. on Saturdays in the Field House. Welcome to my crib: Theatre department chair Harry Waters Jr.